KFC locations in the United States have resurrected one of its least healthful menu items to date—the Double Down. This sandwich features bacon, cheese, and sauce crammed between two breaded chicken filets. The Original Recipe Double Down contains 540 calories, 32 grams of fat, and 1,380 milligrams of sodium. 1. Grilled Chicken and Bacon Increase Cancer Risk. The Double Down can also be ordered with grilled chicken filets, which some customers may assume is more healthful. However, scientists from the Physicians Committee have previously examined KFC grilled chicken products and determined that the grilled chicken contains carcinogenic compounds called Heterocyclic Amines. These compounds are mutagens and are linked with a variety of cancers. The sandwich also contains bacon, which is strongly linked with colorectal cancer. According to the American Institute for Cancer Research, the link between processed meat and cancer is so strong that no amount is safe for consumption. Approximately 50,000 Americans will die from colorectal cancer in 2014. Colorectal cancer is the third most common type of cancer, and just one serving of processed meat can increase one’s risk by 21 percent. Meat consumption overall is also linked with an increased rate of developing type 2 diabetes. 2. Saturated Fat and Cholesterol are Linked with Cancer and Heart Disease. Using the low-carb Paleo fad to disguise the nutritional nightmare, many consumers are unaware of exactly how much cholesterol and saturated fat they are ingesting. For example, just one KFC Original Recipe chicken breast has 145 milligrams of cholesterol—nearly half of the maximum daily intake – and the Double Down has two. Saturated fat and cholesterol intake contribute to clogged arteries. In the U.S., one in every four deaths is due to heart disease. Each year, approximately 720,000 Americans have a heart attack. A recent study from the National Cancer Institute has also linked diets high in saturated fat with an increased risk of breast cancer. 3. Sodium Can Cause Hypertension. Hypertension affects 31 percent of American adults, and nearly 30 percent of teens have elevated blood pressure. This increase in blood pressure is a precursor to heart attacks, strokes, and other potentially deadly health problems. Avoiding oils and animal fats can help blood flow more easily, reducing blood pressure. Potassium-rich foods—such as sweet potatoes, tomato products, and lentils—can help lower blood pressure naturally. Currently, @KFC is marketing the Double Down as a limited-time item. 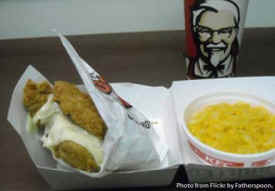 However, during the initial 2010 launch, high sales prompted KFC to extend availably. Consumers who value their health can take a stand by not purchasing the sandwich and insisting that the Double Down be permanently removed from KFC’s rotation.